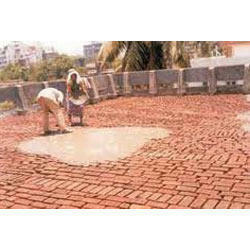 As per the requirement of our clients from across the country, we are involved in providing Waterproofing Brick Bat CobaServices. We have a diligent team of engineers and technicians having vast expertise in their respective domain, which results in providing best possible service to our clients. Our services are known for reliability, cost effectiveness and timely execution. Further, our clients can avail this service as per their precise requirements. Since our establishment in the year 2002, We, “Yash Decors”, are an eminent Supplier, Distributor, Wholesaler, Trader, Retailer & Service Provider, engaged in rendering EPOXY,ROOFING SHEET,WATERPROOFING & CONSTRUCTION Service to our customers. Under these cost-effective services, we are providing our customers with ALL TYPE OF EPOXY, ROOFING SHEET,Water Proofing & Waterproofing Chemical. Apart from this, we are a prominent supplier, trader, wholesaler, distributor and retailer of Synthetic Paint and Epoxy Products. The services offered by us are rendered by our team of dexterous professionals, which holds extensive knowledge of this domain. To provide best-in-class services, we have hired a team of dexterous professionals, which ensures to cater to the exact demands of customers in efficient manner. Our team works in close coordination with each other as well as with our customers to carry out the business related tasks in efficient manner.